Introduction Limited data are currently available for patients with overt hepatic encephalopathy (OHE)) receiving physical exercise (PE). The aim of the current study is to prospectively examine the effect of PE on sarcopaenia in patients with OHE. Methods and analysis At the time of patient recruitment, a precise assessment for nutritional status and daily physical activities will be performed in each subject. Study participants will be randomly assigned into two groups: (1) the PE group and (2) the control group. In the PE group, we will conduct guidance to study participants once a month at the outpatient nutrition guidance room. We will also instruct them to do exercise with >3 metabolic equivalents (mets; energy consumption in physical activities/resting metabolic rate) for 60 min per day and to do exercise >23 mets per week. Improvement of sarcopaenia as defined by muscle mass and muscle strength at 3 months after the randomisation will be the primary endpoint. Sarcopaenia will be defined based on the current Japanese guidelines. We prospectively compared the improvement of sarcopaenia in the two groups. Ethics and dissemination This study has received approval from the Institutional Review Board at Hyogo college of medicine (approval no. 2768). Final data will be publicly disseminated irrespective of the study results. A report releasing study results will be submitted for publication in an appropriate journal after completion of data collection. Trial registration number UMIN000029248; Pre-results. No patient is registered at the submission of our manuscript. To the best of our knowledge, the current study is the first prospective interventional study (randomised trial) to examine the effect of physical exercise in patients with overt hepatic encephalopathy on sarcopaenia. This study limitation is that our study results will be limited to a Japanese population and validation studies on other ethnic backgrounds will be needed. As described earlier, PE conveys multiple health benefits both in healthy persons and several chronic diseases.14 Despite these benefits, scarce data are currently available for patients with overt hepatic encephalopathy (OHE) receiving PE. The aim of the current study is to prospectively examine the effect of PE on sarcopaenia in patients with OHE. From a view point of clinical practice, it should be emphasised that PE under insufficient nutrients and protein intake could be dangerous in OHE patients, given that it could accelerate further protein catabolism and muscle mass loss.15 At the time of patient recruitment, a precise assessment for nutritional status and daily physical activities will be thus performed in each subject. Patients with OHE aged ≥20 years receiving pharmacotherapy (hospitalised or ambulatory patients). OHE will be defined using medical interview and number connection test (NCT).16 Aetiologies for OHE are liver diseases related. Aetiologies for liver diseases are not limited. Patients with acute liver failure and patients with overt HE will be excluded. Patients with severe depression or psychiatric disorder. Patients with severe OHE who are expected to be difficult to participate in this study. Patients with severe underlying diseases such as advanced malignancies, severe infection, severe chronic heart failure and respiratory disorders. Patients who will be concerned about falling. Patients who were judged to be inappropriate for the study subjects from the view point of ability to participate in PE. Our study participants are patients with OHE receiving pharmacotherapy. Pharmacotherapy will include lactulose, rifaximin, neomycin and BCAA therapy. Study participants will be randomly assigned into two groups: (1) the PE group and (2) the control group (regular observation group) (figure 1). Study design. OHE, overt hepatic encephalopathy; PE, physical exercise. Patients with subjective clinical symptoms will be defined as patients with OHE (based on West Haven criteria). Patients without subjective clinical symptoms will be categorised into normal patients and patients with covert HE: (1) patients with no objective symptoms and <120 s in the NCT will be defined as normal; (2) other remaining patients will be defined as patients with covert HE17–19 (table 1). In the PE group, we will conduct guidance to study participants once a month at the outpatient nutrition guidance room. We will also instruct them to do exercise with >3 metabolic equivalents (mets; energy consumption in physical activities/resting metabolic rate) for 60 min per day and to do exercise >23 mets per week.20–25 In the PE group, physical activities equal to or higher than walking for 60 min per day should be strongly recommended for each study participant. In both groups, pharmacotherapy in each underlying liver disease will be continued and we will ask all patients for self-declare of daily amount of exercise. Direct monitoring for exercise will not be performed. Sarcopaenia will be defined based on the current Japanese guidelines.26 Muscle mass using bioimpedance analysis (BIA) and muscle strength (hand grip) for the assessment of sarcopaenia will be calculated once a month. Improvement of sarcopaenia at 3 months after the randomisation will be the primary endpoint. We prospectively compared the improvement of sarcopaenia in the two groups. During the study period and after completion of the study, all subjects will be seen in clinic every 4 weeks to address complications from liver disease and other comorbidities. Compliance with pharmacotherapy will be in particular emphasised. Routine laboratory testings (haematology, biochemistry and coagulation) will be mandatory at study entry and at completion of study, and on an as-needed basis. A major concern with regard to PE is the increase in portal hypertension, and the subsequent higher risk for LC-related complications such as the development of ascites, spontaneous bacterial peritonitis and variceal bleeding.5 14 33 Thus, when the deterioration of OHE as compared with baseline grade is confirmed during study in the PE group, PE will be stopped to the patient. From October 2017 to March 2021. Data will be entered into JMP V.13 software (SAS Institute, Cary, North Carolina, USA) and all data will be checked to ensure their consistency. Data in each time point will be compared. Quantitative variables will be compared by paired or unpaired t-test. Categorical variables will be compared using the Pearson χ2 test or Fisher exact test as appropriate. Based on our previous results of BIA, assuming that α error (type 1 error) is 0.05, detection power (β) is 0.8, difference in the two groups to be detected measured using BIA is 10 and SD of outcome is 10, in order to randomly assign one to one, the number of necessary cases in both groups will be 17 cases (total of 34 cases).26 34 Considering the number of dropped out cases, a total of 40 cases will be required. No data could exist with regard to the usefulness of PE for patients with OHE on sarcopaenia. To the best of our knowledge, this is the first prospective interventional study assessing objectively the effect of PE on sarcopaenia for patients with OHE. From a view point of clinical practice, it should be emphasised that PE under insufficient nutrients and protein intake could be dangerous in patients with OHE, given that it could promote further protein catabolism and thereby muscle mass deletion. An appropriate nutritional assessment will be indicated prior to initiating PE in our subjects. Additionally, caution should be exercised in patients with ascites and marked stimulation of vasoconstrictor systems (renin–aldosterone and sympathetic nervous systems), given that renal dysfunction can develop after PE in our subjects.15 Regarding this point, we will perform the current randomised controlled trial with full care. Patients with high risk for PE-related complications such as falling will be excluded from our study subjects. One of major strength of our study is that this study is randomised controlled trial. One study drawback is that the current study will be based on a Japanese population, and additional investigations on different ethnic populations are required to further verify the efficacy of PE on sarcopaenia and extrapolate to other races. 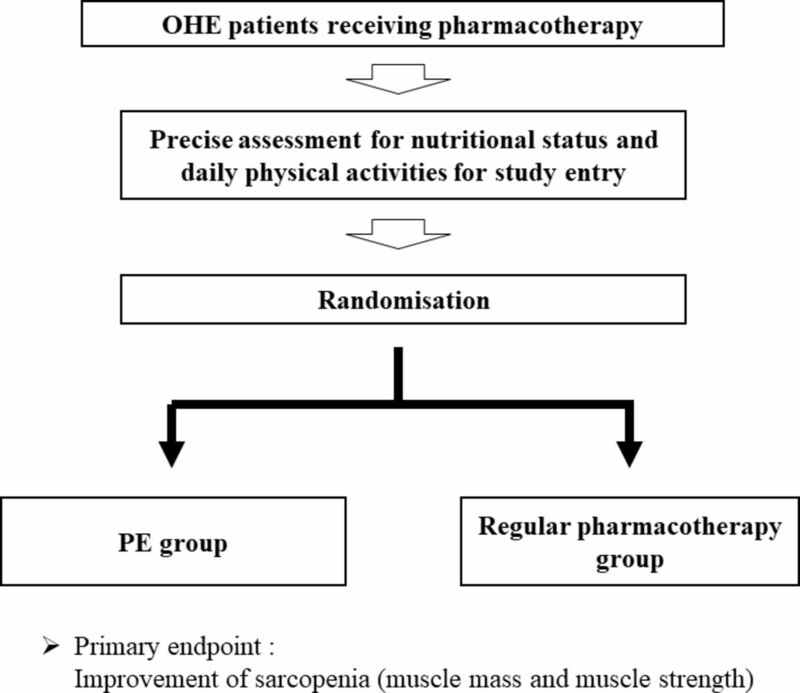 However, if the effectiveness of PE on sarcopaenia in subjects with OHE is confirmed in this randomised trial, then useful information will be provided for clinicians. The study protocol, informed consent form and other submitted documents were reviewed and approved. On recruitment, the research assistant will provide a unique scrambled identification (ID) number to each study participant. Only the ID number will be used to identify subjects. Data sheets and any printout of electronic ﬁles will be saved in a locked filing cabinet in a secure office in the department of Hepatobiliary and Pancreatic disease, Department of Internal Medicine, Hyogo College of Medicine, Hyogo, Japan, with limited access. Final data will be publicly disseminated irrespective of the study results. A report releasing study results will be submitted for publication in an appropriate journal after completion of data collection.
. Optimizing muscle mass: therapeutic target to prevent experimental hepatic encephalopathy. Hepatology 2014;60:304A.
. New concepts in liver cirrhosis: clinical significance of sarcopenia in cirrhotic patients. Minerva Gastroenterol Dietol 2013;59:173–86.
. Patients with hyponatremic cirrhosis have low-grade cerebral edema and poor quality-of-life. Ann Hepatol 2014;13:407–8.
. Serum WFA+ -M2BP levels predict liver fibrosis, development of hepatocellular carcinoma, and overall survival: A meta-analysis. J Gastroenterol Hepatol 2017. Contributors KY, HN and HE: analysed data and wrote the article. SN: supervised the randomised trial. Other authors: recruited candidates and collected relevant data. Ethics approval Institutional Review Board at Hyogo College of Medicine (approval no. 2768).